Click on any of the highlighted product names to see your discount today! Honestly, there aren’t a lot of easy things we can do that will get our day off to a better start. If you’re like me in the morning, I stagger toward the shower seeking redemption by full immersion……. But most showers are just not a religious experience. Either they pee out a highly restricted, mini stream that feels more like you’re standing under a leaky gutter. Or they spread the stream out so wide, you feel like the soap will never come off. Today’s GreatStuffThatWorks product is a shower head that “jumped out like a trout” for its balance of benefits, performance and human engineering. Rohl is a high quality plumbing distributor that built its company originally on seeing value in a new design, the pull out sink faucet and being the first to market it back in the 1980’s. A family run company, they have been discovering and distributing quality innovative plumbing products ever since. This aquatic marvel serves up 5 different patterns of spray, 3 unique and 2 blended, that make waking up a whole lot more enjoyable. Since I’m a bit daffed, I’ve named the sprays, as each has become a new best friend, depending on my mood. The first spray I call (wait, this is deep) “Steady Rain.” Imagine an even, drenching rain flowing over you just where you want it. The firm fingers of water are wide enough for most shoulders and targeted enough to keep your hair almost dry, if you’re in a rush. Rotate the front no-slip rubber ring and the “Goddess of the Mist” emerges. This is an atomizing, air mixing, body caressing mist spray that you’ve probably never experienced in a shower. In the winter, just tweak up the heat setting on your shower valve and create your own mini steam shower. In the summer, it can offer a cool mist that’s gentle on those sunburned shoulders. Neat, huh? And then there’s “Thumper.” This is the pulse mode that helps smooth out the kinks. It won’t beat you like a drum, it’s more civilized. But if you have reasonable water pressure, it gives a smooth throbbing pulse that feels especially good on a tense neck and shoulders. Not many of us out there with that? The other two modes are blends of Steady Rain with either Goddess of the Mist or Thumper. As in wine, sometimes a blend just hits the spot. It’s a miser when it comes to water use, only letting 2.0 gallons per minute slip through its fingers. The head also has a broad swivel, so tall and short humans can get the most from it. Nice. Superior benefits, performance and human engineering make it a shower head you’ll love to live with! And that’s why this shower head qualified as a GreatStuffThatWorks product. This Rohl BI00037 (APC) high quality, multi spray, shower head is probably the easiest route any of us can take to a real “good morning”. Actually, the real reason this shower head qualified as a GreatStuffThatWorks product is because every day I get to shower with a Goddess and Thumper. Oh, yes, did I mention its under $79 in polished chrome? 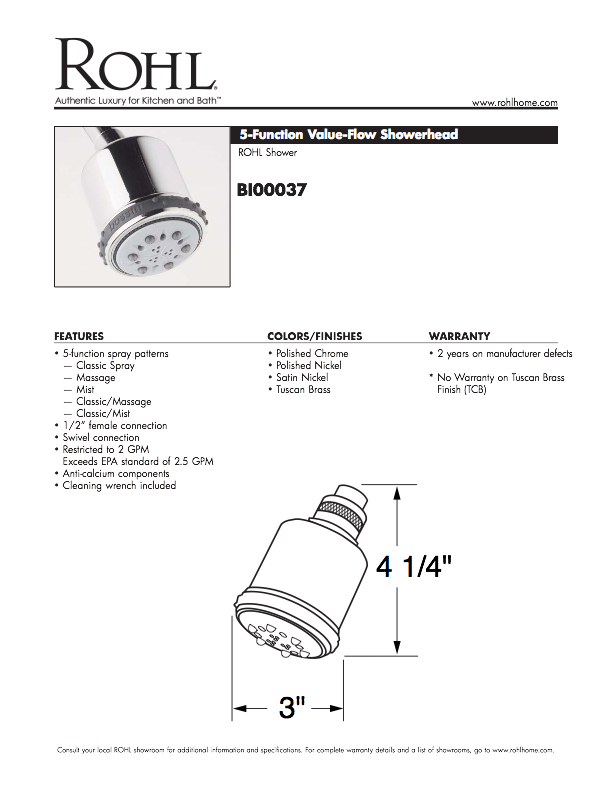 Buy the Rohl BI00037 (APC) if you’re looking for one more way to have fun in the shower. Other finishes available at additional cost. About Us: At GreatStuffThatWorks, you may have noticed we have fun researching and showing you the best products of their type. Letting our extensive research find the chosen few, the products proven to be the ones people love to live with. 1.) 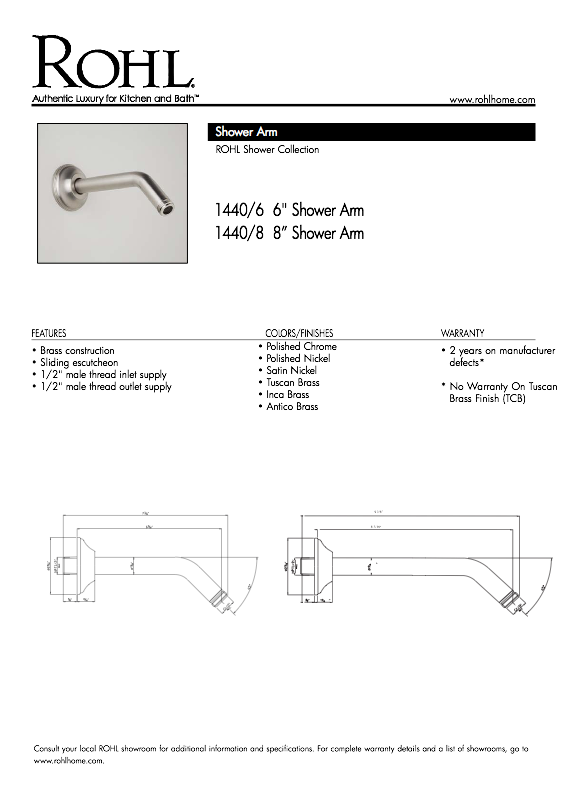 If needed, you can use either the 6” or 8” shower arm pipe (see specs below).